Two copies of the book arrived from the publisher yesterday and sat inside an envelope for an hour and a half as I waited for my wife to come home from work. That was a long wait for someone who habitually struggles with patience. It's a wonderful feeling to hold a book you've written in your hands. It's official, I'm a published author. I love books and I'm overjoyed that my book could be on someone's bookshelf now. How exciting!! I know exactly how you feel - when I finally had a copy of "Moon Kansas City" in my hot little hands, I was PUMPED. Now, the second best part is going around to bookstores to see who's carrying it! Can't wait for the party, and I owe you a phone call so we can swap schedules. Looking forward to catching up! I'm looking forward to buying a finished copy! I read the book in galley form and loved it! 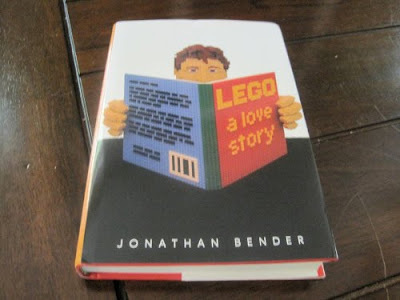 I've passed that galley onto a friend who manages a LEGO retail store. Cool! Congratulations! It has been fun sharing this adventure through your blog. Enjoy! Congrats Jonathan!!! I received my copy yesterday and I started paging through it last night. It's really intriguing so far and very well written! It's been great to be a small part of your journey into the world of the AFOL and you should be really proud of what you have created.